This is a great post. Getting buffer vessels to work properly seems key, especially for commercial applications. 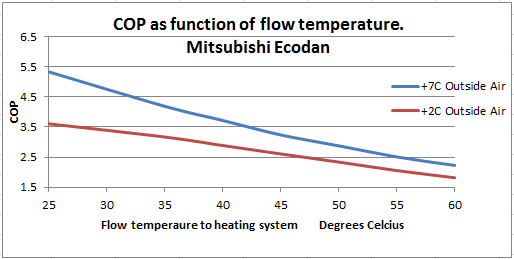 It seems from your graphs that there is mixing going on which is effectively reducing the buffer temp. 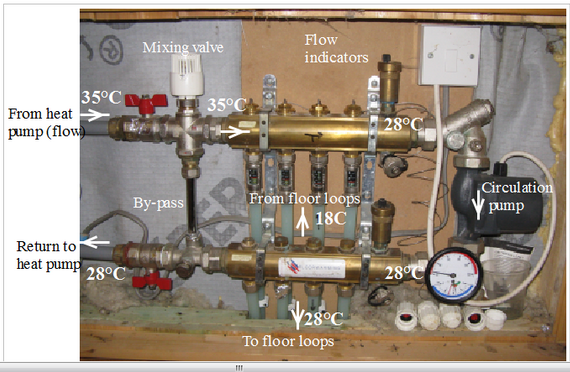 Hence the heat pump needs to provide a higher flow temperature to get what you need to the UFH. I wonder if this can be helped by having large pipe entries into the buffer (lower velocities=less mixing), or even a section buffer to prevent natural convection currents? I believe there are cylinder designs out there which serve this purpose (eg in solar hot water applications). I will look into this. Does your system have weather compensation? My experience has been that control engineers have varying knowledge of this and often have slopes which are too shallow ie the flow temp doesn't drop quickly enough with increase external temp. Yes, the example of a buffer that I monitored was a poor one, and as you say, could be better with intermal distributor/baffles etc. Yes, weather compensation usually good, although normal curves not ideal for very high thermal mass building, and also debatable for air-source. I guess it will take a few more years before control systems are developed to a better level. Have you looked at specifying a superplasticiser (water reducer) in the screed or slab? I used a polycarboxylate super plasticiser for my screed, and if I remember correctly it had the effect of increasing the thermal conductivity of the dried screed by something like 40% (in addition to reducing cracking). 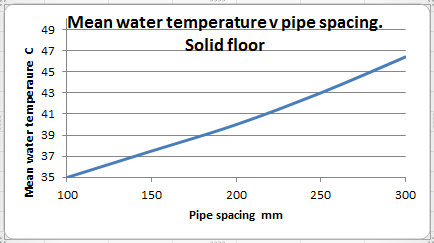 Interesting post especially the graph on the pipe spacing. I would always use 150mm. Also I would like to add that I find a lot of people are still sceptical of heat pumps for their home as a result of the initial cost of installation. Thanks for your thoughts, what spacing would you use if you were using a gas boiler?